Bastion Saint-Philippe occupies the south-west corner of the town wall and, along with the curtain walls that link it to the Porte de Dinan and the Bastion Saint-Louis to the south-east, forms the town’s second expansion (1714-1720). 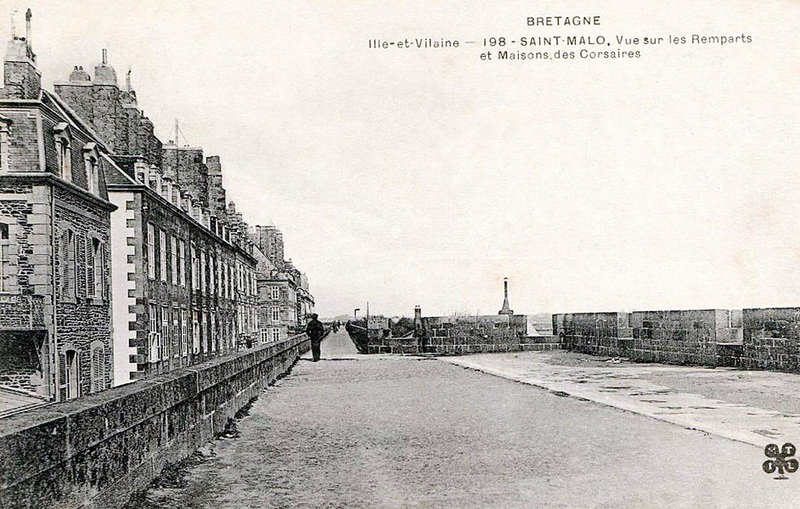 This whole neighbourhood was created by filling in the sea, based on plans drawn up by the engineer Siméon de Garengeau (Paris 1647 - Saint-Malo 1741). Saint-Malo’s ship owners, who made their fortunes from captured ships, seafaring along the Pacific coast of Latin America, and the Saint-Malo East Indies Company, formed a company with 24 shareholders in order to allot the 44 blocks of land constituting the new neighbourhood. However, the houses’ construction proceeded quite slowly: only 13 houses were built in 1725, along with 15 other houses up until 1770. Many sites continued to be worksites so that materials could be deposited there, or were used to set up single-storey warehouses for ship owners. This neighbourhood was called “La Californie” because it was inhabited by rich, wealthy people such as gold diggers. In 1944, most of the fine houses in this neighbourhood caught fire, but the famous row of façades termed “Corsaires” along the ramparts was rebuilt exactly the way it had been before under the supervision of Raymond Cornon, the senior architect at the Historic Monuments Commission. The building to the left of the entrance to the Rue de Dinan, which has a chimney stack decorated with a sun-dial (1 Rue Saint-Philippe), was the home of the famous Robert Surcouf, the French corsair, from his marriage in 1801 until his death in 1826. The building was also used for administrative offices by the French Navy.